Cyclopia aurescens Kies var. glauca Kies, Cyclopia dregeana Kies, Cyclopia falcata (Harv.) Kies var. 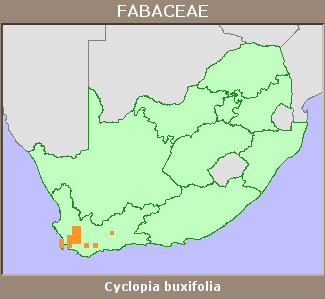 ovata Kies, Cyclopia latifolia Benth., Cyclopia latifolia E.Mey., Cyclopia subternata Hofmeyr & E.Phillips (in part), Cyclopia vogelii Harv. (in part), Cyclopia vogelii Harv. var. subternata (Vogel) Harv. (in part), Genista buxifolia Burm.f. A widespread, montane species that is not threatened. Skurweberg to the Outeniqua Mountains. Rocky, humic, sandy soil, 830-1 670 m.